Carpet Cleaning Equipment and Machines. Carpet Cleaning Supplies at Discounted Prices. One of the first, if not the first, to distribute carpet cleaning supply and carpet cleaning machines on the web. Cleaning machine and floor buffers - SAVE. Click on the links below to see that page. 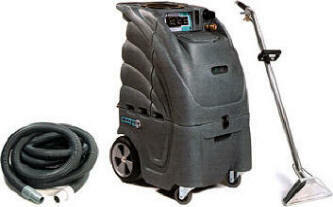 Carpet Cleaning Equipment, machines and Supplies. Which machine Should I purchase ? First question. Why should I purchase a portable instead of a truck mount carpet cleaner. It's a money thing. If your just starting out and you have the money for a heavy duty van, advertising, expenses and the truck mount then go with a truck mount. A person that cleans properly using the proper procedures and uses good quality chemicals can do just as good of a job with a portable than a person with a truck mount. With so many carpet cleaning extractors out their which one do you choose ? I can point you in the right direction and give you my opinions but this is a decision you will have to make depending on a few questions you must ask yourself. What type of area will you be cleaning, inner city, suburban, new or older homes, mobile auto detailing or stationary detailing, commercial cleaning, hospitality, food service or you may want to do what ever you can get ? The reason this question is very important is that most more powerful units need to be plugged into 2 outlets that are 20 amps and must be on separate breakers. Why ? Because most heated units pull over 2000 watts just with the heater. Then you have the dual vacuums (2 each vacuum motors) and the pump. All of this power is split between 2 cords. If your doing inner city older homes you will have a problem finding 20 amp outlets. Most commercial and hospitality should be OK. Newer homes usually have 20 amp outlets in the bathrooms and kitchen. You can also use the machines that have heat without the heater on to cut the amperage draw considerably. Our company's' belief is that a person using the standard 25' hose set, that most carpet cleaners use, would do a good job with a 100 psi, dual 2 stage with heat unit. Read about cleaning carpet and read section on carpet restoration. If you think you can handle the extra amperage go with the 3 stage vacuum units with heat and 100 psi pump. The three stage vacs give you as much vacuum as a truck mount running long hoses. Some contractors have told me they have made splitters that plug into the 220 volt outlet used for dryers. These are easily made for under $50.00 and could handle a powerful unit. I recommend having an electrician put it together for you. Some contractors have told me they have a generator in their van to run one or both of their cords. Another question would be how will I be using the machine ? Is this for a homeowner for him or herself, for a part timer looking to make extra money, for a back up machine, for a janitorial company using it on occasion or for the full time carpet cleaner. The below is my suggestions and is only a suggestion. I do recommend when ever possible to use a heated machine. Home owners - 6, 11 or a 12 gallon with heat like the Mercury, Ninja or Galaxy 100 psi or the 6 gallon Sensei. I also like the 4 gl spotter extractor. Mobil Detailer - A single corded machine unless your running a generator. Either a 6, 11 or 12 gallon with heat if possible. Detail shop - 100 psi, dual 3 stage or 2 stage with heat . Either 6, 11 or12 gallon. if you running wish to run a long hose upgrade to a more powerful pump and you can clean as far as 100' away from the unit. Janitorial Company - Most janitorial companies that purchase a 11 or 12 gal extractor with a standard 100 psi pump and dual 2 stage vacuums which can be used almost anywhere. If you can get a unit with heat then do so. You can also use a self contained for large areas. Carpet cleaners (commercial) - Go with 100 or 200 psi, dual 2 or 3 stage vacs with heat. If your going to run more than 30' of hose upgrade to a larger pump. Remember prescrubbing with a carpet scrubber (floor buffer with carpet brush) will allow you to do the best ever job cleaning a carpet. Carpet cleaners (residential) - Depending on electric, I like the Stinger 12 gallon #01-200, Mercury 2-100H, EDIC 2000SX-HRH or Ninja N22AHMO all of which are very versatile. carpet cleaning supply, carpet cleaning machine, carpet cleaning equipment.